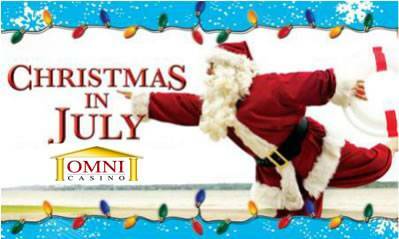 Omni Casinos third annual Christmas in July celebration runs from 23 July 2012 to 27 July 2012. Come join all the fun, prizes and bonuses! Read more here! Omni Casino is giving away five $200 dinner comps to your favorite local restaurant! All you need to do it play between 23-27 July (min $500 in total wagers) and you will earn ticket entries for each day played in accordance with you VIP level. Play all 5 days and earn 10x more total tickets! All Omni members are also invited to receive a $30.00 bonus on their first deposit of $20 or more made on July 23, 2012. On July 24, 2012, all Omni Casino players are invited to receive a super value 205% bonus on their first deposit of $10 or more up to 80.00. On July 25, 2012, all players will receive a 250 spin point boost for every 1000 real money tournament spins played. That’s a 25% boost and your point boost will be included into your “Beat the Heat” total on the July 27th leader board posting! Finally, players are invited to receive surprise deposit bonuses each day on 26 and 27 July, 2012 on their first deposits. The bonus on their first deposit of $30 or more each day is a surprise! But we can tell you that it’s more than 66% and less than 201%. i think its really great news for us.